I have received no fewer than a dozen marketing emails in recent weeks that included the oft-used phrase “spring has sprung.” This hopelessly hackneyed phrase was the sole reason I groaned and deleted the emails immediately. Did I want to see what deals and cute shoes these retailers were offering? Yes, I did – but it was the principle of the matter. Google “spring has sprung” plus “PR Newswire.” I got more than 2,000 hits this morning. Google that phrase plus "PR newswire." Or search the cliché alone. The result: 570,000 mentions. We all can slip into overrelying on jargon, clichés and vapid phrases. I get it. You’re in a hurry and have an hour to write this press release that has landed in your email, or you’ve got writer’s block and you’ve just got to get this one done, or you know what marketing speak your client or internal audiences like to use to describe their company or their products. We use clichés because they are easy to remember, widely understood and don’t require creativity on our part. Writing meaningful press releases is an art and good business – but it’s bad business to keep using the same trite and tired terms. It’s also writing in a way that focuses more on sounding like you know what you’re talking about as opposed to really knowing what you’re talking about and risking the chance of muddying the message and losing the audience’s attention along the way. Case in point would be a phrase like: Our innovative, cutting-edge technology is a turnkey solution for end-users. Sound familiar? It’s using clichés to convey a point without really saying anything. What are some others you would add to this list? What are you guilty of leaning on? How about some creative replacements? Or do you think there are times when the use of a cliché is warranted? Most PR and marketing pros care about using language to communicate clearly, concisely and effectively and know we need to strike a balance between sounding intelligent and delivering a coherent message. Thinking on this may compel us all to think critically about the meaning and power behind the words we use. It’s up to us to be the cliché killer. Resources: This exercise reminded me of author of viral marketing specialist David Meerman Scott’s 2006 study and subsequent Gobbledygook Manifesto as well as Adam Sherk’s 2010 study. 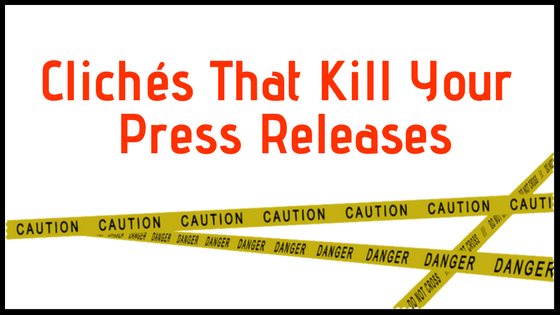 Both analyzed thousands of press releases for business jargon and revealed some of the worst – most frequent – offenders. TrizCom PR thanks our 2018 Interns!